CHICAGO (AP) — One more point could provide a big lift for the Dallas Stars. They get another chance on Saturday night. Dallas’ playoff road remains muddled after it lost 6-1 to Chicago on Friday night. Patrick Kane scored twice in the Blackhawks’ home finale, and Cam Ward made 25 saves in his 700th NHL game. The Stars (42-32-7) clinched their first postseason trip in three years with Tuesday night’s 6-2 victory over Philadelphia, but they need one more point to secure the Western Conference’s top wild card. Finishing on top of the wild-card standings would mean a first-round matchup with the winner of the Central Division, which remains up in the air heading into the final day of the season. The second wild card will take on Calgary in the opening round. “This was a nice way to finish the season here,” Kane said. Joel L’Esperance scored for Dallas in the third period, and Anton Khudobin made 26 stops. The Stars played without captain Jamie Benn, goaltender Ben Bishop, forward Mats Zuccarello and defenseman Roman Polak, who all skipped the trip to Chicago. Bishop remained sidelined by a lower-body injury, and Benn, Zuccarello and Polak got a chance to rest. Valeri Nichushkin was sick, and Montgomery said it was a coach’s decision to scratch Andrew Cogliano. The 35-year-old Ward became the 28th goaltender to reach 700 games when he came in after Corey Crawford departed in the second with a groin injury. He made a point-blank save on Seguin in the final minute of the period. Kahun kicked it off when he poked a rebound through Khubobin’s legs at 11:11. Then Kunitz was awarded his fifth goal when a replay review showed his bouncing shot just crossed the line before it was swept away. Strome added his 20th of the season when he made the most of a fortunate deflection with 2:09 left in the second, and Koekkoek made it 5-0 with a sharp-angled shot 44 seconds into the third. It was Kunitz’s fifth goal in his 15th NHL season. The four-time Stanley Cup winner could retire when the season is over. After L’Esperance got Dallas on the board at 7:18, Kane got his 44th goal when he beat Khudobin on a breakaway with 3:49 to go. Kane has three goals and four assists in his past five games and needs two goals in Saturday night’s finale to match his career high of 46 from the 2015-16 season. NOTES: Coach Jeremy Colliton said Crawford will not travel with the team to Nashville for Saturday night’s season finale. G Kevin Lankinen was recalled from Rockford of the AHL on an emergency basis after the win. … Stars F Justin Dowling returned to the lineup after missing three games with an upper-body injury. 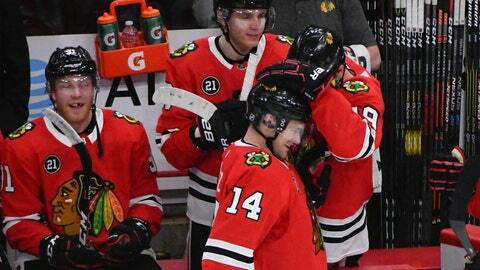 … Blackhawks F David Kampf played after he missed the previous two games with a facial injury. Marcus Kruger was scratched. Stars: Host the Wild on Saturday night. Blackhawks: Visit the Predators on Saturday night.